‘A Song of the Desert’ is a poem written in 1927 by Rudyard Kipling in remembrance of his friend, Perceval Landon, who had died that year at the age of 59. 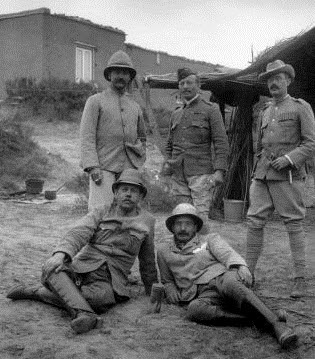 In 1904, aged 35, Landon had accompanied the Younghusband Expedition to Lhasa. The ‘expedition’ was a military one, sent to forcibly open up a trade route between Tibet and British India. 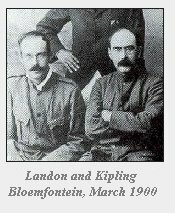 Landon was one of four correspondents, what we might now think of as ‘embedded journalists’, who travelled with the British Military Force, sending reports back to various newspapers in Britain and India. Along the way, as did many members of the British expedition, Landon acquired and collected various trinkets, curios, and objets d’artsome of which he later donated to the British Museum. One of these objects is currently the centrepiece of an exhibition at the BM, titled: Krishna in the Garden of Assam (closing August 15th 2016). The Vrindavani Vastra is a nine metre long textile, made up of twelve strips of woven silk, each figured with depictions of the incarnations of Vishnu and scenes from the life of Krishna as described in the 10thcentury Hindu text, the Bhagavata Purana. The textile, which is thought to have been created around 1680, was discovered by Landon in the monastery at Gobshi, near Gyantse in southern Tibet. But how did this textile depicting Hindu religious scenes end up in a Buddhist monastery in Tibet some 300 years or more after it was originally made? 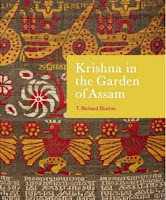 The exhibition, along with an accompanying book and film, by my friend and colleague, Richard Blurton, explains the fascinating detective story of archival research and contemporary fieldwork which has helped to rescue and restore the cultural context of this very rare work of art. 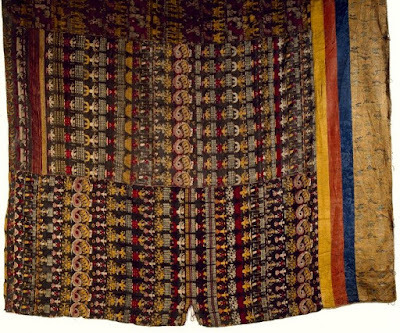 Very few textiles of this kind from this period, which originate from the Assam region of northeast India, have survived; and indeed, the weaving techniques used to create such a cloth are no longer practiced there. 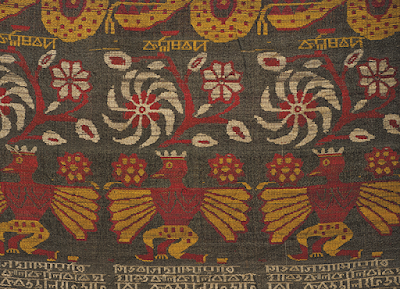 For almost 80 years after it was given to the British Museum by Landon the textile has languished in obscurity, wrongly classified as being of Tibetan origin due to its provenance, it is only now that the real facts regarding its history have come to light. Landon’s eye was attuned very differently. 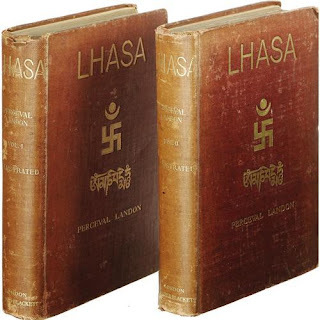 An uncommonly artistic correspondent, his own two volume account of the expedition, simply titled Lhasa (1905), was illustrated with his own photographs and watercolour paintings. 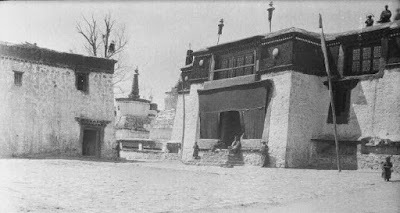 And, as Clare Harris has noted, Landon frequently uses an artist’s vocabulary to describe what his camera and his watercolours could not; for example, describing the entrance to Lhasa’s Jo Khang thus: “Granite, dun, grey, yellow, pointing white, Prout’s brown yak hair curtains, dull crimson pillars, valance Isabella-colour, sacred monogram gold, sky ultramarine.” Landon was a great champion for what he termed as the ‘National Art of Tibet.’ He and Laurence A. Waddell acted as members of the official Collecting Committee, allocating the most significant discoveries to the official Government collection. Certainly, many such items were collected during the mission at all social levels from the officers to the soldiers, and hence, a great number of Tibetan art works in museum collections across the world have frequently been found to derive from this source, with many family heirlooms still surfacing and being taken to museums for identification even to this day. It is thanks to Landon’s discerning eye that we have this remarkable textile, an Indian artefact long preserved in a Tibetan sanctuary, unknown and misunderstood but prized and highly valued nonetheless, transcending cultures over the course of three centuries. At last, its story is finally being unfolded.